PRO BI™ IS ON SALE, 35% Off ALL SIZES, until Wed. Dec 3! All Sizes on Sale, 35% Off All Weekend Long! Sale starts Thursday, November 27 through Wednesday, Dec. 3. No coupon code required. Sale price will be the price displayed. PRO BI™ is a biological feed additive designed to maximize digestive efficiency. An animal's beneficial intestinal bacteria can be destroyed or depleted and the pH of their environment can be altered during times of stress. Competition, travel, breeding, treatment with antibiotics, de-wormers and other medications can cause this stress. Stress can also be created by alterations of weather, environment, feed, and water. PRO BI™ in final form, is not a source of live organisms. However, it does supply the by-products they produce. 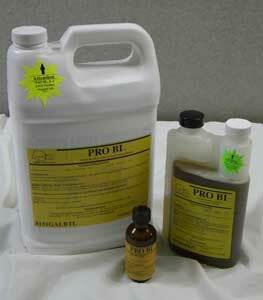 PRO BI™ provides the benefits obtained from live cultures without the problems and concerns of using pure cultures.